Lehmann Black Cube Linear review | What Hi-Fi? 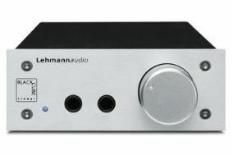 This Lehmann Audio headphone amp is neither a cube nor wholly black. Incongruous name apart, though, it's impressive. It's undeniable that £750 is a lot to spend on an headphone amp, but hear this with a top-class pair of headphones – £300 upwards – and a suitably talented source, and you'll be left in no doubt about the unit's considerable skill. If the disc is bright and edgy, as our recording of Tchaikovsky's Marché Slave Op.31 is, you'll hear it harshness and all. Feed in a good recording – Eric Bibb's Good Stuff, say – and it will deliver a natural and informative sound. And it is detail obsessive, digging up a huge amount and arranging it into a cohesive and convincing whole. Perhaps even more impressive is that it doesn't forget to be musical. Dynamics, agility and timing are all spot on. The feature count is fair. There are two headphone outlets and a line level output. So, if you want, the Black Cube Linear can work as a single source preamp, too. However, it's as a headphone amplifier that the unit impresses most. As far as sonic performance is concerned, it's the best we've come across.